Unless you live under a rock, you’ve probably seen some of the controversy surrounding Go Set a Watchman. The “sequel,” released last week, was actually written prior to To Kill A Mockingbird and focuses on Scout as an adult. Harper Lee’s editor liked the childhood flashbacks in Go Set a Watchman and encouraged Lee to rewrite the book focusing on Scout as a child and, thus, To Kill A Mockingbird was born. Rumors and speculation abound around the “newer” novel. The timing of the book’s release along with information about Lee’s ability to provide informed consent — a drastic shift in position after years of stating she never wanted to publish again — is shady to say the least. You can read more about that here. Lack of informed consent in publishing is not new. Kafka requested that his works be destroyed after his death and he was clear throughout his lifetime that he did not want them published. In addition to issues surrounding informed consent, other controversy surrounds Harper Lee. Some have said that Harper Lee didn’t really write TKAM but rather that the book was written, at least in part, by her childhood friend Truman Capote. The Wall Street Journal published a story about data miners who analyzed both books and debunked the idea that Capote wrote TKAM. Rumors aside, was it any good? Keep reading to see our thoughts. This was a difficult book for me to read. To be perfectly honest, I felt like a terrible person for buying the book. I do believe that the circumstances surrounding the book’s publications are questionable at best. I have serious concerns that the people surrounding Lee have exploited her for the opportunity to make a lot of money. But, what kind of book blog would this be if we didn’t review the one book that everyone is talking about? I first read TKAM as a teenager and loved it. I reread it as an adult a few years ago and also really liked it, albeit less so. You can not go into this book holding onto any sentimentality about your favorite characters. 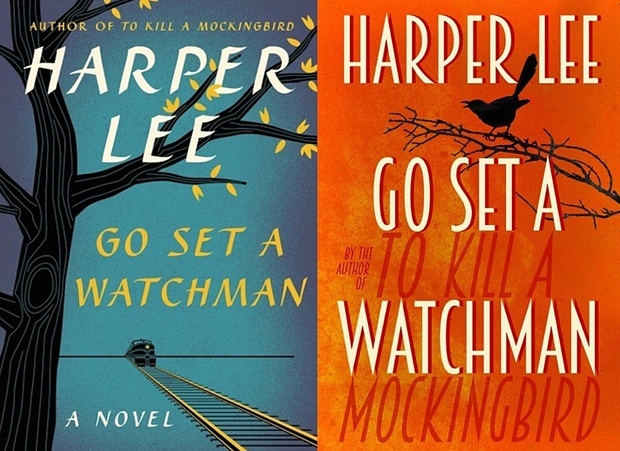 Go Set a Watchman is largely about disillusionment whereas TKAM was about hope and idealism. The Atticus that we all knew and loved, when seen through the eyes of an adult Scout (Jean Louise), is an Atticus that is far from the moral and upstanding ideal we read about in TKAM. The truth is that this version of Atticus was probably a more realistic representation of his times and place. For me, the Atticus of this book was a complex man who had his morals and ideals, was a good father but held racist beliefs that were a product of his environment. This book wasn’t perfect and it has the feel of a debut novel (much more so than the highly-edited TKAM). Lee takes more than 100 pages before getting to the interesting elements and some sections alternate between rambling and stilted. I found some of the debates about race and prejudice to be a little clumsy and cliche. It did, however, have some appeal to me because there were some parts in the book that felt like a very raw and genuine reflection of the times. It broke my heart to read about the more complex version of Atticus, and I think I cried along with Scout when she realized that her father wasn’t the perfect man she had been led to believe as a child. I do think it’s worth a read, particularly to see how Lee’s ideas developed over time. Her publishers were clearly smart to get her to focus on the childhood flashbacks because it’s the childhood voice of Scout that makes TKAM so wonderful. There is no question that TKAM is a much superior book. You will be disappointed by Go Set a Watchman if you go into it expecting to read a worthy sequel. However, the book has its merits and some parts are very thought provoking. I was really excited when the news broke that this “sequel” to Mockingbird was to be released. Then the news started to break that Atticus was no longer the man we all adored from the original. In fact, instead of upholding his principle of treating everyone the same, Atticus was now shown to be a racist. In my mind I thought those early reports must be wrong, or at least out of context, but sadly they were true. I read Watchman really wanting to like it, and right up until the end I liked Jean Louise. She knew what was right and wrong and she couldn’t live with the fact that most people in her hometown of Maycomb were basically racist at heart even those who had taught her racism was wrong (Looking at you here Atticus). Jean Louise describes herself as color blind. She doesn’t see black and white, she sees people and she is largely true to that principle. In terms of Mockingbird I consider this book to be a failure, however, I have given it 3 stars because I have separated it from Mockingbird and treated it as what it essentially is: a lightly edited manuscript from a novice writer. Ending aside it was an alright read. I like the voice of Jean Louise and I liked the flashbacks to a more innocent time. Should this book have been published? Leave aside the issue of consent and Harper Lees ability to make an informed decision about publishing, I would say this book never should have been billed as a sequel to Mockingbird. It could have been published as a manuscript showing the early inception of the characters in Mockingbird and from that point of view it is of historical interest. In my opinion, Mockingbird said everything it needed to say and could have been left as the only book Harper Lee ever had published. Now the book is out there I would recommend anyone who hasn’t read either book should start with Mockingbird and approach Watchman as a totally separate entity. Book Worm: [Added after reading Jen’s Review] The review above was my first reaction having just read the book since then I have read other reviews including Jen’s that have made the point that the attitude Atticus has is typical of his time and place in history. That may be the case. I still don’t have to like it and I still hate the ending. My dislike of the ending aside, I do accept that this is probably a more accurate book in terms of character attitude and should probably be given credit for that. We want to hear from you. Have you read it? Do you plan to read it? Why or why not? I’m on the fence about this book… I believe I will read it, eventually. I’m not super excited about it, but I am intrigued to read Harper Lee’s initial story sans heavy editing. I also had reservations about reading this one. There’s a strong ethical argument against it. Curiosity got the better of me and I did read it. My reaction was similar to Jen’s. I understood Atticus’s attitude, but it still didn’t sit well with me, but overall I liked the story and where Lee was going with it, even if it’s not as polished as Mockingbird. The academic and writer in me loved going behind the scenes to see the manuscript Mockingbird grew from. Interesting thoughts on Go Set A Watchman from The Readers Room! The aforementioned article about “the debate” reminded me about Timothy Cavendish from Cloud Atlas. I haven’t decided to read it yet as I have the same feeling that it is being published against the wishes of Harper Lee. In reading both of your reviews, I can’t help but think about the tipping point that most children go through when they realize that their parents are people too — meaning that they have weaknesses. I haven’t decided if I am going to read it yet either. If my book club picks it I definitely will read it. I agree with Book Worm that the book should be advertised as a manuscript. When I first read of the publication of this book and found that it was not going to be edited in any way, I knew it would not live up to the hype. I think book editors are so important to the process. And the question of informed consent is so important. I do not think it is a surprise that this book was published after her sister Alice died who was so protective of her. Great post and thanks for all the links. I am going to share with my book club.